I spent all of last week visiting a hospital, and the beginning of last week visiting an intensive care unit. When I got back home, my reading priorities seemed a bit different. 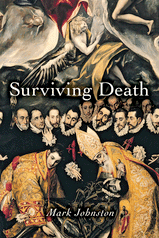 Mark Johnston's new book Surviving Death had risen to the top of the stack. I'm not going to blog about it systematically, but just make an occasional comment as I read. Why do we need "salvific" ideas? What's there to be saved from? I've always felt I was a terrible candidate for Christian conversion, because I completely lack the sense of being a sinner. I've never felt any need for salvation. So--he's looking for a "fix" for all that, and it's going to be religious in a very broad sense, but free of supernaturalism. Stay tuned.